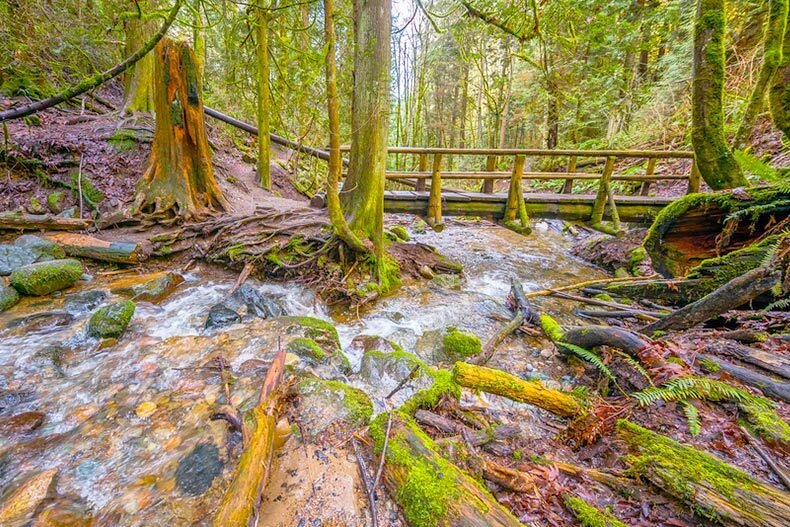 Living in Washington could mean living near gorgeous creeks like this one in Issaquah. Washington embodies so much of what the rest of the country knows the Pacific Northwest to be. Whether you love coffee, rainy days, wooded national forests, or the urban feel of Seattle, it’s likely Washington State will have something for you. Some might not immediately think of Washington as a state for active adults but it actually offers many of the comfort retirees enjoy. That includes mild winters and warm summers, ample outdoor recreation spots, and a variety of dining, shopping, and entertainment options. If you’re thinking of calling Washington your home, here are the most affordable communities in the region. This quaint community is perfect for out outdoor lovers. Quail Run at Terrace Heights consists of 117 single-family homes that come in seven different floor plans. Homes run from 1,200 to 2,142 square feet and include two or three bedrooms, two bathrooms, and two- or two-and-a-half car garages. Amenities in the community include a 2,500 square-foot clubhouse with an exercise room, entertainment room, library, card room, catering kitchen, and billiards. Outdoors, homeowners enjoy a pool and spa, patio, BBQ area, horseshoe pits, dog park, and R.V. parking. One of Western Washington’s more established 55+ communities, Fairway Village includes 824 condominiums and single-family homes. They come in a variety of different floor plans that range in size from 1,140 to 2,358 square feet. They include two or three bedrooms two or two-and-a-half bathrooms, and two-car garages. Residents in the community have many private amenities to enjoy, including two fitness centers at the clubhouse. Also at the clubhouse is a billiards room, ballrooms, library, saunas, game rooms, and meeting rooms. There’s also an outdoor pool, patio, BBQ area, two bocce ball courts, and walking trails. Golf lovers will be glad to know the community is also home to a nine-hole golf course. Its location all provides residents with many outdoor recreation spots and easy access to downtown Portland. The first Seattle area community on the list is Providence Point. While some homes go into the $600s, many of the 1,008 homes are priced below the $300s. They range in size from 800 to 2,000 square feet and include one to three bedrooms, one to three bathrooms, and one- or two-car garages. The community includes several private amenities encompassed in four different buildings. The clubhouse includes an indoor pool and spa, exercise room, a multi-purpose room, and a catering kitchen. The South Community building is home to an aerobics and dance studio and meetings rooms. The North Community building has a library, arts and crafts studio, and meeting rooms. The Town Hall includes Our Place restaurant, Our Cafe, Collin Hall, and a multi-purpose room. Outdoor amenities include nature trails, a putting green, gardening plots, and a tennis court. Back in Yakima is the quaint, gated community The Villas at Terrace Heights. It includes 66 single-family homes that come in six different floor plans. They range in size from 1,491 to 1,870 square feet and include two or three bedrooms, two bathrooms, and two- or two-and-a-half-car garages. Amenities include a clubhouse with a multipurpose room, a catering kitchen, and card tables. Outdoor amenities include walking and biking trails as well as parks and natural spaces.